Step 1: Dice the onions, pepper, garlic and separate them into 3 even piles. Step 2: Cut the potatoes into “sticks and stones” – this is honestly the key to the whole thing. This is the secret. Half the potatoes should be cut into thin strips about an inch long and the width of a wooden match. (sticks). 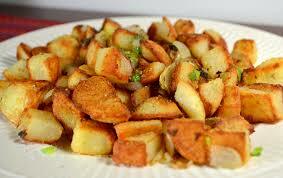 Half the potatoes should be cut into cubes that are about a square centimeter (stones). Note: this process takes forever. Step 3: Get a big fry pan and put in a solid wunk of butter. When it gets hot, put in 1 pile of your onion/pepper/garlic, douse it with the spices, and fry it up good. Step 4: Put in another wunk of butter and throw in your potatoes. Now you’re in for the long haul. You’re gonna stand there for a solid 45 minutes stirring and turning the potatoes. Keep in medium-high heat. Keep chucking in butter and spices. It’s a process. Step 5: After about 30 minutes, throw in pile #2 of your onion/pepper/garlic mix. Keep frying and cooking. Step 6: When they’re ready the potatoes will be a solid mix of crispy and mushy. Now throw in the last pile of onion/pepper/garlic. Cook another 2-3 minutes, stirring the whole time. Serve those mothers up. They’re awesome with any breakfast food – eggs, bacon, pancakes – it doesn’t matter what you serve ’em with. They’re perfect.